Pretty, right? Made in Taiwan. And, since bikes are mainly known as means of transportation, I use mine to get around the city. 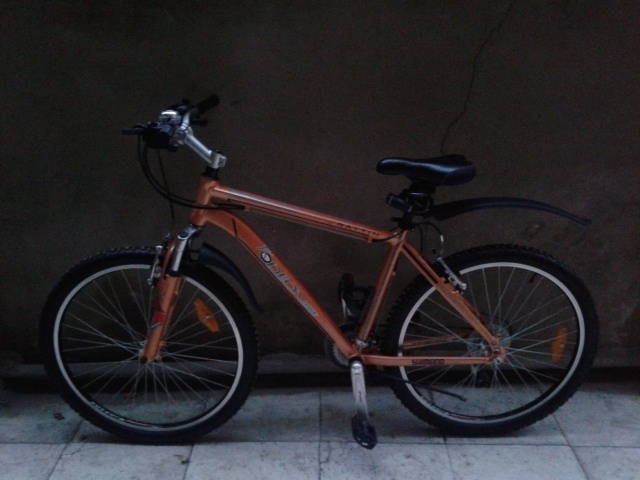 I ride it to work, to Arabic class, to go out... you know, the usual. In the beginning, it was mainly fun. Sure, the dust is awful and traffic is crazy – there are not a lot of rules, cars pull over without warning and buses start and stop wherever and whenever they damn well please (or wherever and whenever there is a potential passenger waiting, even if that is right at the base of the on-ramp of one of the busiest bridges in town, but that aside) – but all in all, the roads are quite good, there are no hills to speak of, and it's not as dangerous as one might imagine. However, I quickly learned that it's not all that usual. I mean, there are certainly plenty of people who ride bikes here. Hell, I've even seen people who ride a bike with a long rack with bread on their head! Or a serving tray with a complete breakfast on it! But the thing is, those people riding bikes are not women, and that's what makes the combination of me and my main means of transportation so special. Apparently. Hey, you, good, good! Bravo! What's your name! (preferably from across the road) or How are you! First bike-accident in Cairo is a fact, thanks to the helpful guy who kept screaming ‘watch out watch out watch out’ trying to warn me about the gigantic concrete block he had put in the middle of the road. Which I then didn’t see, because I was looking at the screaming guy. Result: I flew over the concrete block, and my bike flew over me. See that guy there? With one hand on a double(!) rack of bread? Yeah, he's riding a bicycle. Now that deserves awe and respect. The good part? The women. Where the surprise of boys/men comes out as annoying attention-seeking or hurt-ego-compensating, I have yet to pass one woman who does not smile when she sees me, and give me a look that says: you go, girl. It's awesome, and I hope that somehow, somewhere, they will get to experience that same rush of wind and speed and owning the road that riding my bike in Cairo gives me. *Important footnote: I was standing at an intersection yesterday when a group of teenagers started commenting on me and my bike from across the street. They kept going, eventually surrounding me, touching my bike and screaming things at me. It was more annoying than dangerous, so I tried to ignore them (which is kind of hard when someone is changing the gears on the bike I am sitting on), when suddenly a man in a suit appeared. He picked up two of the boys and threw them towards the sidewalk, then grabbed two others and pulled them in the same direction. The rest of them followed. He then lectured them in front of everyone, without even once looking back at me. I was very grateful to see an Egyptian man telling other Egyptian men(-to-be) that this kind of behavior is not ok. Thank you, man!